How do you feel about fondant? Fondant is a pliable medium made mainly of sugar and is used to flawlessly cover and intricately decorate cakes. Between the cake and fondant is a thin layer of buttercream or chocolate ganache so that the fondant can adhere to the cake. Because fondant can be molded into almost any shape, design possibilities are limited only to our imaginations. Many people eat around the fondant as it’s quite sweet. Some of my friends (I won’t any mention names) savagely scrounge for fondant scraps from other friends’ plates. It should also be noted that fondant cakes should not be refrigerated. As they’d come to room temperature, they would “sweat” and likely cause water spots or color bleeding. And since these cakes should not be refrigerated, flavors are often limited to certain fillings, i.e. you typically won’t see a fondant cake with fresh strawberries and custard. Is there a specific look and feel that a pre-made cake from the grocery store or large bakery just won’t do? Are you looking for a one-of-a-kind cake that will have all your guests instagramming and facebooking the whole night? Custom cakes typically require at least two weeks advanced notice. It is strongly encouraged to plan ahead so that the designer has the opportunity to communicate ideas with you, purchase special materials or ingredients, and of course create the edible art piece. If your event is in 2 days, you should certainly still ask your custom baker if it’s possible, but be prepared to pay a rush fee. Like any custom work, custom cakes have custom pricing. It is something designed and created just for you. The average pricing in the Silicon Valley for a custom fondant cake starts at about $6.00 per serving. Aside from the obvious aesthetic abilities you can get from a custom cake, our most favorite reasoning behind the investment are sentimental ones. The cake in the above photo was for Kazia & Ben’s wedding. When they were in college, before they had met, Kazia was nicknamed “Mama Bear” since she was the RA for her dorm. After they met, Kazia soon found out that he, too, was nicknamed “Papa Bear” for being his dorm’s RA! 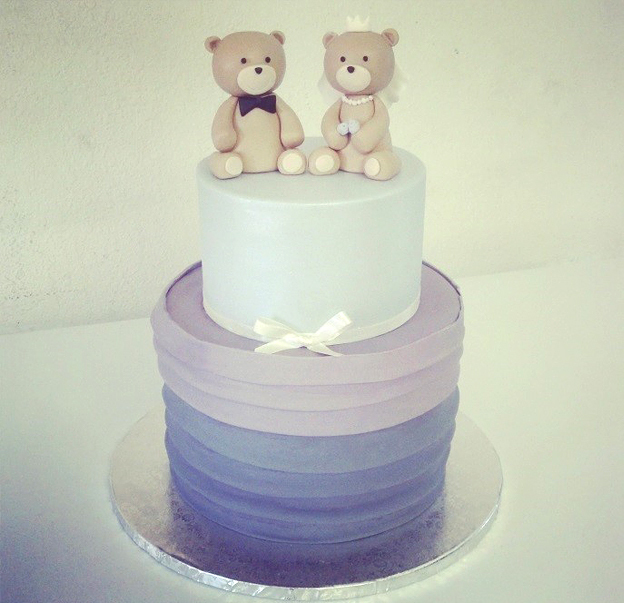 Naturally, we hand-sculpted a teddy bear groom decked out in a bow tie and a teddy bear bride fashioning a veil and pearl necklace, bouquet in paw, ready to wed. Maybe, one day soon we’ll have an opportunity to make a Goldilocks themed cake with baby bear! 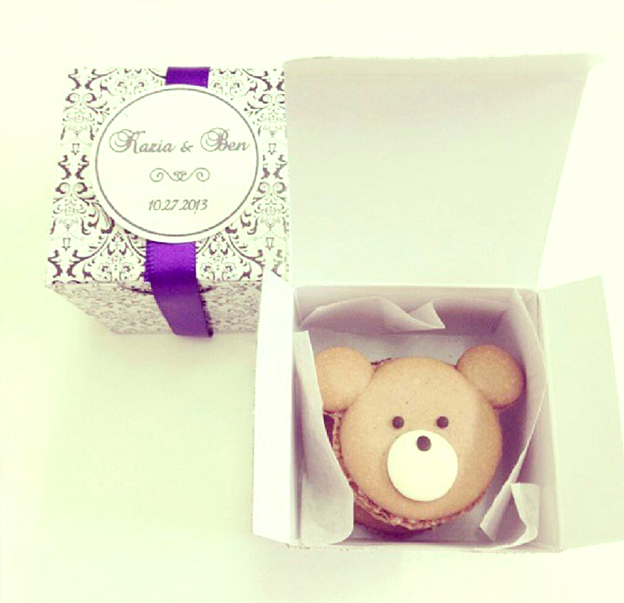 To take the bear theme up one more notch, we also made bear shaped macaron party favors. The mother-of-the-bride told us that no one took them home….they were all devoured at the reception! Custom cakes and desserts act as a conversation starter, a centerpiece, an edible glue to connect the components of “you”. Themes like this allow a story to be told. What’s your story?